Sometimes home decor from the store just doesn't cut it. It lacks a personal touch and that's why DIY is so great! You can make pieces for your home that you can put your own stamp on. When someone comes into your home you can proudly say, "Hey, I made that!" Check out these easy to follow instructions and then watch the video to see how you can make this gorgeous wall art. 1. Remove the backing from your picture frame and paint the side that shows through the frame with gold paint. Allow to dry fully. 2. Place artificial fern leaves face down on the gold painted backing. 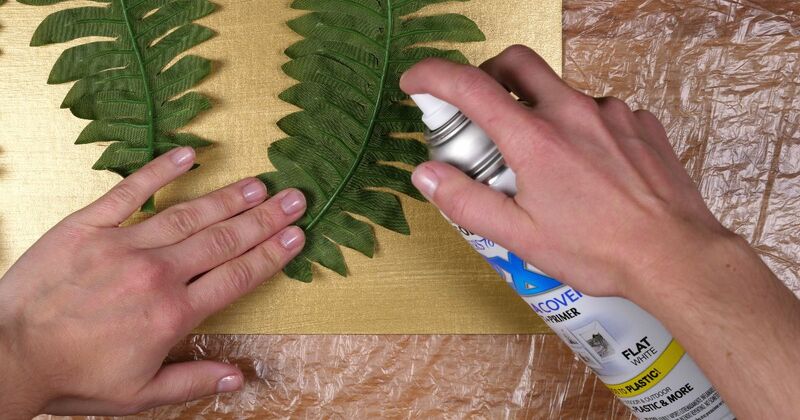 Using your hand to hold down each fern as you spray, cover the whole backing in white spray paint. 3. Remove the artificial fern leaves and allow to dry. 4. Place the backing back in the picture frame. You can choose to paint the picture frame gold as well. 5. Display your new art in your home.